The 2011 Masters will go down as one of the most thrilling final rounds of all time and as always, Augusta delivered! With the action intensifying on the back nine on Sunday afternoon and McIlroy faltering, players from the chasing pack began to pounce and we witnessed one of the most historic charges from the worlds best at the time. Despite an unbelievable four birdies in the final four holes from Charl Schwartzel, one shot sticks in the mind more than any other, cue Tiger! Standing in the middle of the fairway with just over 200 yards to the pin on the par five 15th. He flushed it. Landing within a couple of feet from the hole (ignore the fact he missed the eagle putt), it’s a shot that’s gone down as one of the most memorable from that sunny Sunday afternoon. But what does a shot like that do to our perception? Both professionals, amateurs and the sports fan on the sofa are guilty of basing our broader judgements on these memorable, yet incredibly rare standout moments. Leveraging our global database of over 1.4 million shots, advanced machine learning techniques and a unique data science team, we have identified shots such as that flushed mid-iron from Tiger in his prime have massively distorted our judgement on what a good shot really is. Fundamentally golf is hard. Really hard. 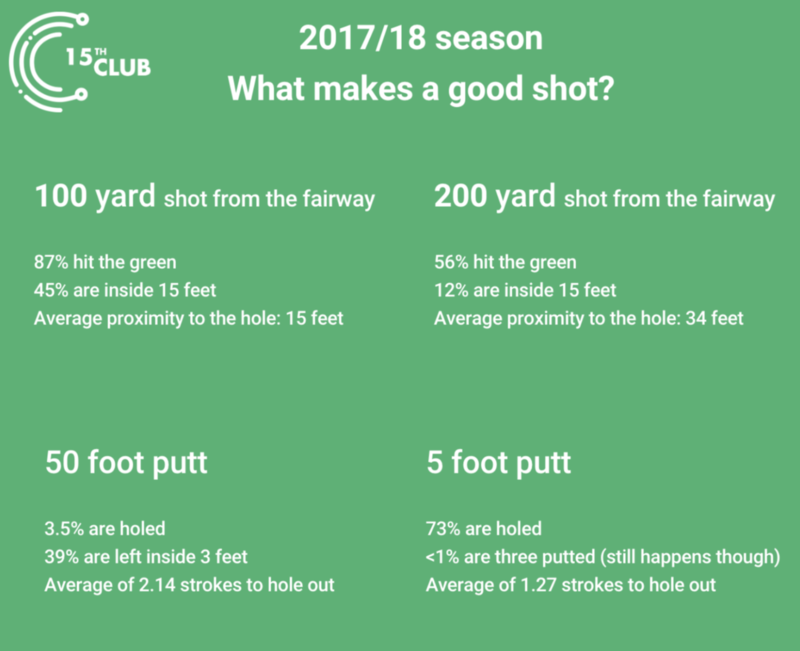 As you can see from the infographic above, the average shot from 200 yards on Tour last year only hit the green 56% of the time, 12% hitting it within 15 feet and the average shot from 200 yards landing 34 feet from the hole. For players looking to improve their game, they first have to understand the benchmark they want to measure themselves against. Trying to hit it within 6 feet from 200 yards is a luxury, and obviously would have major implications in lowering your score. But unlikely it presents the best return on range time. The real strength comes in understanding what the field is doing with these shots and bettering that, rather than trying to emulate arguably the best approach player the game has ever seen. Peter Alliss, as he so often does, summed it up perfectly during the broadcast of The Open in 2015 – “Loads of young guys come out and try to swing it like Tiger Woods comparing their game to his. Now you’re not going to be as good as Tiger so there’s no point in comparing yourself to him. If you take a look at this guys game (Thonghcai Jaidee) you have something you just might get to”. We all want to hit it as close as Tiger, but we can’t. It’s typically unrealistic to set such high aspirations. We’ve got to compare to the rest of the field to get an accurate representation of what a good shot actually is.